Lou Gerstner: “People do what you inspect, not what you expect”. In other words – “What gets measured; gets done”. That is the golden mantra for any person who is put in charge of reviving a sick or failing company. I have been at the helm of reviving two sick companies in my career. The last one was the most dramatic. We turned around a company with 3crs of sales and 6crs of liabilities to 24crs of sales and 6crs of profit in just 2 years. There was no magic to it. There were only 2 new products and variants. There were no new great talents added to the company because the company could hardly afford people. It simply takes systematic, methodical execution of action plans, daring to break past rules of the industry and bold, decisive leadership. The process, though, can be traumatic in some parts and that is part of managing a business. Since the PC launch, computer giant IBM was slaughtered by many small competitors during the late 1980s and early 1990s. Lou Gerstner was brought in to revive IBM in 1993. Gerstner achieved was most thought was a tough task if not impossible because IBM was that big fat elephant. He wrote a book about the turnaround of IBM which I read in 2002 – “Who says elephants can’t dance”? That book is an inspiration for any manager who is stuck with a sick company or a sick branch. It is a marvelous story about the reengineering of IBM. It has a hilarious quote from an IBM executive about reengineering: “Reengineering is like starting a fire on your head and putting it out with a hammer”. 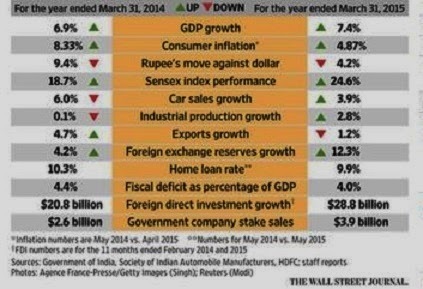 Inflation is down, rupee has been relatively stable, 2014-15 showed GDP growth of 7% plus, Coal and other national assets have been auctioned more sensibly and transparently, mining benefits have a greater share for states, rescue operations for Indians (and other nationals) abroad, strong impact of India on world stage. All mundane stuff; eh? That’s what corrupt Congis and some media crooks would have you believe. For the muck created by the previous govt in a decade many morons want everything solved in a year. It is like expecting a duffer like Pappu to suddenly grow brains in a week which he hasn’t managed in 44 years. There are many more accomplishments that I can list but that is not exactly my objective. The most important as Arun Jaitley put it – from a climate of gloom, the country now looks up in optimism. Add to that the fact that we now have a govt which we don’t constantly worry about indulging in secretly scamming the country. The intentions are honest, the direction is right. The road ahead maybe different and varied but as long as the direction and signals are right, people should back a govt that will not cheat them. There is no govt in the world that is ever going to give a “golden era” to its people all of a sudden anymore and no one even expects it. All that people want is a govt to be honest, transparent, acknowledge mistakes and punish law-breakers. My other interest, of course, is – where does the corrupt MSM stand now? That is the way so-called editors are being treated these days. People on SM expose their stupidity instantly. 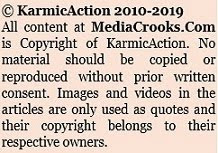 Each time the Modi-hating media crooks have tried to tar the GOI, the facts coming out later have thrown dinosaur-eggs on the faces of all media channels and editors – like the fraudulent “Christians under attack” campaign. Even in the Nepal earthquake tragedy Nepalese showed their contempt for Indian reporters and channels for their scavenging over the dead. They will not change but people have changed on how they consume the crap our MSM produces – with truckloads of salt. Nobody takes an opinion or news item from these criminals at first instance without double checking with multiple sources. This is the greatest accomplishment by people and, to some extent, Modi’s tactics with the media. Apart from that, most are behaving like mongrels deprived of their regular crumbs on AirIndiaOne junkets. There’s no more free lunch. We may have lot more to demand from ModiSarkar but I have no doubts that his govt is on the right track. That is why I dismiss all the bogus, fact-less criticism of Congress and its Commie allies and their pimps in the media. 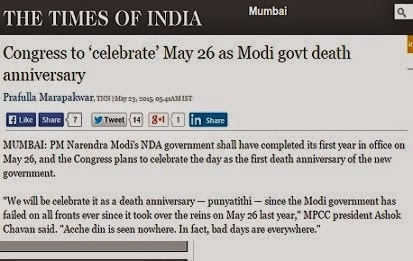 If the Congress wants to celebrate the “death anniversary” of ModiSarkar they will sink themselves further into the sludge they’re already in led by a delusional juvenile jerk. I don’t place much value on silly polls but even most polls show over 70% of people satisfied with ModiSarkar. I was shifted to sales and marketing in a crisis situation by one of my companies. I turned around that branch and since then, as I narrated, I turned around two other sick companies. I have learned a very valuable lesson in that experience that I would like to share with you. The last company I turned around was sick but once we started raking in more profits and cash-surpluses the MD & Co kept demanding more and more cash-flow. Suddenly, the huge cash-flows were disappearing and we were facing cash-crunches. It was an inexplicable situation. We even started defaulting on bank-loans and payments to creditors. On a serious investigation I found that the MD and his family were siphoning cash from the business to invest in real estate of enormous proportion and engineering a crisis in the company that they thought employees would stand up to. Fake LCs, real estate deals, purchase of expensive properties in Mumbai and other places – that’s where all the turnaround cash-surpluses went. That is what Congress did and will do to India. I dumped that company when I learned about these misdeeds. The lesson is – an honest ModiSarkar is one I would trust with my money and support in the years ahead. At least he won’t siphon funds from turnaround-around surpluses while keeping India on a steady path of growth and power. Can you trust Congress or some stupid Janata Pariwar similarly? In reengineering India ModiSarkar need not set its head on fire. Simple honest, transparent work will do. You have said it. We need jokers to amuse and entertain us, thankfully have many headed by one in LS. In the end, only Modi's actions and inactions are all that matter. Political rhetoric and and the "Tu Tu Main Main" squabbling with the opposition, alienations and associations with various political entities are just unfolding of the Indian political drama. "Great leaders are almost always great simplifiers who can cut through the argument debate and doubt to offer a solution everybody can understand." People expect dramatic turnarounds , something which happens in movies. Geeta replacing Seeta and teaching the bad guys a lesson overnight - types. Ministers and bureaucrats working honestly and sincerely for 8 to 10 hours a day is good enough and we should expect that. Changes will happen. BJP govt has brought such positivity and hope in last one year, like never before. From - iss desh ka kuch nahi hone wala to expecting/ demanding and positively hoping "Acchhe Din" itself is a big deal. 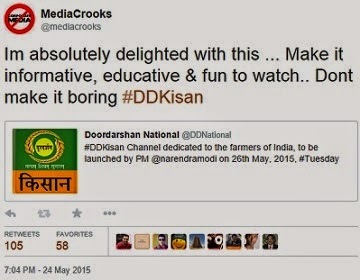 Great article as always mediacrooks!! wonderful piece from Ravinar. The need of the hour is also unity of purpose from all those support Modi and him and the country to succeed.One thing that can be done is that all the affiliate organisations shall start doing something positive for the majority community so that unity among all castes of majority community is achieved even when they want to keep the separate identities.This will ensure a voting pattern which will beneficial to the country as a whole. Ravinar ji...time and again I have said this and will say it again.... somehow convert all this you write in hindi and other vernacular languages and spread it throughout india....start it now without delay.... only awkening of social media won't do.... each and every indian in every nook and corner of india need to wake up to the reality. And all readers of this website....kindly spread all these thoughts in your home, relatives, friends and neighbourhood. Building strong India is not resoonsibility of only ravinar or modi or smriti etc. This responsibility is of every soul who consider itself truly concerned patriotic indian. Vande mataram. Jai Hind. yes congress toady hindi journalists like ravish kumar, abhay dubey tc will get exposed, if u do come out with hindi translations of ur blogsite. on twitter if u make a sarcastic remark on ravish kumar he blocks u, and he himself keps taking potshots on everyone all the time. he has no right to talk about freedom of speech. yes. these articles should be translated to reginal languages. at least immed in hindi. i will try posting a translated version. lets see if the same 'punch' can be created in the translation. I am sorry. I must add - with Ravinar ji's permission. Even now,many people say - "Govt. ke paas bahut paisa hai"..this is the perception which actually destroyed India internally. For more than 60 years, Cong, Commies and associates cultivated this perception among people in a well planned manner. And of course, serving foreign interests. Government and Citizen – two separate entities. It’s government’s duty to provide and it’s peoples’ right to consume. It’s really hard to make common people believe that, govt runs on their money only, which is generated by their effort utilizing the resources provided by mother earth. A govt can’t have an extra penny except that. But why Cong and Commies did that? It helped them to loot. You won’t bother for anything as long as you don’t feel that thing belongs to you. As we all see how people litter public places but keep their own house clean. Even a small low cost house becomes beautiful place to live when every member of that house feel that it is his or her. And it is the responsibility of every member of the house to keep it clean, protect. It is really very difficult to clean the mess created by cong and commies in every segment of our government and society, within a year or two. It will take time. In one year many things happened and everyone is aware of that. Reviving Economy (Coal, Spectrum auction,Jan Dhan Yojona, Jan Bima,etc), Successful Foreign policy....many. But to me, the most significant thing which Sri Narendra Modi’s govt has achieved – People from every corner have started to think again, that, this is their Nation, their Govt. and as Indian, a sense of pride. So, It is not just a ‘Happy Birthday of a Govt’ but Rebirth of a Nation. Wonderfully written. But I have a suggestion. I have no doubts about the honesty, integrity, the wisdom and sincerity of the Modi Government. But don't you think that despite their sincere efforts to bring about a metamorphic transformation of Indian economy, somewhere along the road, the government is losing the battle of perception, partly due to canard of the opposition and partly due to their own actions. The efforts of the government are aimed at bringing about a long term revival of the Indian economy through consistent, relentless perseverance of its cherished goals. But, the economy the present government inherited from the previous governments had left many pockets of underprivileged, who have been living the drudgery of life with barely enough to eat. These people are in urgent need of short term policies which cater to their immediate needs. The government's policies though laudable, are like Vitamin Pills, which help in gradually rejuvenation of the patient. But, this section of society is akin to a patient on a death bed, who requires Life Saving Drugs, in the form of short term and immediate policies aimed to attend to their needs. So, my suggestion is that though long term policies are fine, yet a more synchronized combination of economic policies is the need of the hour, so that the destitute and the underprivileged feel immediate relief. And also sufficient media coverage should be garnered to show case the achievements of the government to the people at large. You would agree Sir, Perception matters in Politics. Populism though not efficient Economics, yet is Efficient Politics. For achieving the greater objective of serving the people and bringing about transformation to their lives, you have to remain in Politics. And for that a little touch of Populism is needed. I think Modi needs to get more aggressive in his approach. I must admit that Kejriwal has been more successful in taking the fight to the opposition camp in every case. Take the recent case of Kejriwal wanting to supersede the LG because he is the elected one and not the LG. On the same lines, Modi should also assert that he and his MPs in the Lok Sabha are the chosen one and put pressure on the Rajya Sabha MPs who are indulging in the tyranny-of-the-unelected-and-unelectable. Why should a PM who got a massive mandate for change be allowed to be stifled by the RS jokers who can't win a municipal elections on their own? While I understand that's how the constitution is but Modi should have or still should raise this question aggressively. There is no harm in learning a few tactics from Kejriwal. People are still with Modi - let him be more combative - let's expose the Congi morons and their designs to stall every reform. Its important to do good but even more important to be seen doing good. ha ha, when Kejriwal is seriously thinking of emulating Modi's strategy, you are advising Modi to follow Kejriwal's tactics? You will find within next few days, Kejriwal getting into very serious governance, leaving all his tactics behind. Agree that this GOI should become more aggressive.But you can't advise them to follow Kejriwal.AK and his AAP are the last thing country needs. Hi Ravinarji, looks like Paradise lost and Paradise regained. Bharat mata ki jai. I am surpirsed how the media tricksters could even qualify as the most popular PM candidate, when he is worse than a school drop out and a Pappu in real terms of dictionary meaning. How any one can suggest his name ? and assign 10% of Indian population voting for him. which is outright insult to educated India. This is like there are jobs plenty and still unemployment at its peak. Conclusion most do not want to work a little extra that will make them lead a life of self respect and integrity . Second The success of PVNR , NDA Govt and CAG vindicated on an out of the world unimaginable corruption coupent of 176,000 crores and still BJP loosing in Delhi . The only explanation is people on SM financing the looters. Common Man are happy with the crumbs thrown by the looters and delight at boot-licking the masters . How can India hope to be better when the Indians do not want it It is the santan-karma keep doing the good without seeking rewards that keeps the SM going and looters enjoying. Time to say Go to Hell Sanatan Dharma and fight it out on the streets with the looters & their empty top followers . Might is right is . Any takers. Just one comment. Sanathana Dharma does not say to be inactive or do "good" the way you seem to be defining it. Krishna made it amply clear that even killing your own relatives at war to protect Dharma is good. In Kali Yuga, people get confused about what is good. That's what is happening. Sensible and honest citizens eagerly expect the demise of CONgress party. We all keep on forgetting one of the most important accomplishment of Modi Sarkar. That is, thwarting 26-11 type terrorist attack when a boat from Pakistan was stopped in its track at the high sea. We tend to forget the importance of prevented crime. We would never have known or even imagined the magnitude of the terrorist attack, had 9-11 culprits been stopped at Boston Air port or had boat full of terrorists had been apprehended at Mumbai harbor. A very interesting news has broke out today about TRAI chairman Pradip Baijal's upcoming book revealing MO of UPA/MMS/Congress for running the government. Yes sir. Rightly said. Intention is right, direction is right. Honest, passionate, able administrator and hard working PM. There will be hiccups but we need to support. Slowly even the good folks in other parties will start supporting. BJP ruled states should perform in the next 4 years and this shoud be the driving point in next elections i.e. quality benetifts of governance. The media is still against BJP govt (read Modi) and they should be taught a lesson by doing things with single minded devotion atleast for these 4 years to ensure next general election win. Thereon Khangress will disintegrate on its own for they seldom have any patience and cannot be away from power for a long time.... need to decimate them. Media is crying too hard or too loud..... indicates that they are losing the battle with Modi & his team. if performance was the Criteria NDA should not have lost. we wasted a whole decade rather a rebirth. The freebie culture has eaten away the enterprising hard working. Law & order has to be 1 for all hefty punishment to corrupt and I feel Modiji has to start rewarding this enterprise. albeit small crowd.for Tectonic Shift Extra rebate to people working in private sector service class employees who struggle it out as compared to govt servants, , Incentives for use of credit card , fast q's for admission .. Incentives for making loan /utility payment on time higher penalty for default . Let this government say that it wants to reward the honest . Agricultural Income has to be taxed. No way they can escape. start with some threshold.. Think Khangress must have rigged the electronic voting machines, in which the software person who proved the rigging was silenced, else there cannot be such routing in election for BJP. The tampering of voting machines and feasibility of its integrity needs to be tested by professional hackers. Very well analysed...when you compare the country with a sick company, it makes great sense. I think the single most important achievement of Modi has been giving positivity and self-confidence to Indians. I see ordinary people openly counter articles in magazines like Guardian, Economist etc without being burdened by the white man's opinion. Modi has also reduced the Gandhis to a bunch of jokers and open to ridicule. The MSM had treated the Gandhis to be some divine creatures above criticism and today they are treated for what they really are...a bunch of looters and jokers. The expectations of people from the Government have changed completely and I have never seen youngsters so involved in politics and the nation in general. As you said rightly, the intentions are good, the direction is correct and the signs are there. Indeed.This is good way of wishing happy birthday to Modisarkar.And thanks to Modi and "media crooksi" - many in MSM are turning proper morons now.may more have started singing different tunes.This has happened in just one year.Imagine the scenario in 2019. Within a year It is really very difficult to clean the mess created by cong Govt, in every segment of government and society It will take time…..! In one year many things happened,and Changes will happen.from Namo..govt…..! has brought such positivity and hope in last one year, like never before from congress government. Siphoning of funds from the working capital of a company reminds me of the lakhs of people who have voluntarily given up subsidy on their LPG gas.Frankly i can afford it but desisted from forgoing subsidy.For as long as a nationalist govt is in place, this sacrifice will go a long way in supporting the govt and our fellow citizens. What if by the notorious lunacy of the indian electorate the KhanChris makes a comeback? The LPG subsidies will then line the dynasty pockets.Did ask many BJP media cell mgrs if there is a provision to reclaim the subsidy at a later date. But no reply was received. Since ur have been on biz and media may I ask what is the role played by our business channel in the country today. 1.Spoken english and share market jargons day in and day out.Sharemarket jargons intangible to any aam aadmi. May i ask why not the govt stipulate a media policy for business channels to coach budding entrepreneurs on the basics of setting up and running business enterprises. Guide the aam aadmi on the govt rules and clearances, tax laws, marketing technics etc. Explain in detail all the share market operation related terms with examples. This will go a long way in boosting our domestic investments and thereby job creation. I keep saying that bjp needs to be extremely careful about everything especially about women security and law and order in general, a huge attck was subverted by coast guards but as expected by congress stooge indian express, they gave impression that it was all orchestrated. Even if bjp performs much better than congress ,congress jokers like ndtv will always try to bring people attention towards what has not been done rather than telling what good has been done by bjp. if 200 good results have been produce and 5 bad results , congress slave ndtv and indian express will take people's attention towards those incomplete work and will completely take attention away from those 200 good results. while if congress has failed on all the fronts, this same congress friendly media will try to take people's attention away from those failures of congress. In the end i will again say bjp will have to be extremely alert and careful all through out their tenure especially about women security because pseudo-feminists ongress stooges in the media will make every effort to blame bjp government of incompetence rather that blaming culprits. Although the same media did not make that much hue and cry when their own congress friendly media person, tarun tejpal had been accused of molestation for which he himself apparently apologized as well in an email. This congress friendly large section of media will politicize even the most serious issues like women security and communal violence, just to get political advantage for congress. It reminds me of a famous quote " Great people talk about Ideas, mean people talk about people ". Modi Ji has proved that he is a person of passion, ideas and a true patriot. Congress and their ilks are not able to stomach the real Indian growth story on all fronts under the leadership of Modi. They clearly know that they have been completely sidelined by the people and somehow they want to maintain their relevance by hook or crook. These brainless jokers should realise that is a common man is clever enough to distinguish between a doer and a talker and cannot be swayed by false propaganda, while he may not react immediately.The LS election results provides testimony to that. Congis and their partners including media, are proving to be mean people who have nothing to offer except spitting venom and indulging in mud slinging and thus deriving cheap pleasure as if they have demeaned Modi Govt. I can only pity these jokers who are becoming irrelevant and facing a slow death..
i do not think that bjp has ever thought about it but bjp,s major mistake is that they come out with tag lines in the campaign which can be easily attacked, like india shinnng, acchey din etc. All that the congress stooges need to do is to find some problem in any corner of country and keep harping on it day in and day out and ask whether india is shinning or acchey din have come about. if one is bent on finding problems then u can find problems even in most developed countries as well. Bjp must understand this cunning strategy of congress stooges like NDTV. Like congress and AAP, bjp must be cunning and must not commit anything in the tag line of election campaign It has to be effective tagline yet it has to be non-commital. you are right. The BJP has to present something good to the gulliable population. People easily forget that Railways have hardly added any tracks in last 60 yrs, that expressways were initiated by BJP, that Pune expressway was built by SS-BJP, that MP roads were improved only after BJP came in, Chattisgarh has improved because of BJP being in Govt etc.. Here in Maharashtra, congress has been fooling people by promising electricity every 5 years, roads on boundary of Mah to Gujarat or UT like Silvassa are in contrast to each other, irrigation had a 70k crores down the drain and so on.. But it is very difficult to talk to people. They thought modi is a magician or a God who can give them Nirvana immediately. I am not impressed with this piece at the least. 100 % marks for there being no Governmental corruption during this one year. But corruptions everywhere, for which we need policy changes. Go to a Village Office to get some job done or to the airport for customs clearance or for that matter at the docks. Go to the Registrar Offices, Motor Vehicle Offices and so many such Offices. All these places are manned by Indians. Corruption is the rule of the day. I do not expect MODI to cleanse this system, for it is not possible. Your story does not convince me, for it is a story. Let Modi cleanse Air India and I want you to be the CEO to bring it to the heights like Emirates. We can then talks about issues. The corruption is very high very high indeed.. you must have heard reports on hyper inflated air bills and fake media ads. Not a single area has been left. So to remove all this will take time, infact lots of time. If there is no corruption at top, the corruption at bottom will start reducing but it has an inertia. Also why progress is slow.. you must have heard about scorched earth policy of the russians in WWII. In Maharashtra, Congress went about preparing development control regulations of countries biggest city - Mumbai.. The BJP Govt just came in 7 months back and that time the report was presented to public. What did it say - develpment on CRZ zones, development on illegal slum areas, development on coastal, removing 4000 trees in green belt Aarey, Now no bureaucrat and a common engineer or a common clerk will prepare such type of Development control rules. So who prepared ? It was plain mischief by the congress govt which demited power. 4. providing more railway tracks and improving current tracks. - this is how railway is going to advance. otherwise in past 60 yrs we have konkan railway to show. This will means a bhaiya typically working in Mumbai, Pune, Banglore will take much lesser time to travel to Gorakhpur etc and return. 7. Coal block auctions have been carried out - thus now electricity expansion will be possible. Commited electrictiy to farms improve yields drastrically. 8. No scams in last one year - This is going to slowly but steadily percolate at lower levels. 9. More allocation of funds to states - good states like Gujarat and Chhatisgarh will improve. 10 . Communal - it has to be explained that all that sporadic attacks on churches proved to be work of miscreants. How can Govt be part of all this. Regarding very few muslims or christians in govt - they have to stop misgivings towards BJP and join. Remember it was BJP who got Abdul Kalam and congies removed him. There may be many many more..
For houses on rent, the rent agreement should be registered to be legal and property tax should be linked to the rent received. Rajdeep sardesai , barkha dutt r trying there level best to brand hindutva supporters as non-secular fanatic goons and after i have read their comments on twitter, i am sure they have done no research on history and philosophy of hinduism and islam. The goal posts have been shifted for the Modi Sarkar.. But last week Modiji made it amply clear that he cannot guarantee ache dins for looters. Why r u waiting in the queue? Sonia bhakt,kejriwal bhakt hindutva hater pseudo-secular sid ji pranam,trust me right now biggest problem in india is pseudo-secularism from which all congress stooges want to divert attention by mentioning other issues,so that no one talks about congress and congress friendly media's (NDTV)hatred for hindutva philosophy which they have done no research about. The biggest problem right now is the misinfirmation that anglacized congress and anglacized congress toady media is spreading about hindutva, philosophy. No reason for us, in Maha to cheer one year of Modi sarkar. . Raj had asked Modi to devote the five years to north states, but Modi does not seem to be interested. The usual rapes, gang rapes, murders and other atrocities continue to be reported from north. Also people up north are so smug they could not care less. 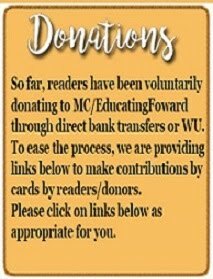 Banning the documentary by Udwin does not seem to have helped much. Back home in Maha, a 42 year old case involving the attack on Aruna Shanbhag, which left her in a vegetative state was in the news. News channels traced the attacker to UP, where else? We heard the villagers there tell us what an angel the guy is. Meanwhile in Mumbai, a marathi manus was told to buzz off when he dared to apply for a flat in a predominantly Guju housing society. Heard the camel and the Arab story. Any wonder Kashmiris want to keep Indians out? Hey BBC why don't you send Udwin to do a documentary on diet racism we in Maha would surely like this atrocity to probed. Vivek: First of all Modi has control of only military which cannot be used against gang rapes, murders and other such crimes. Only state police can control (or don't control) such crimes. So your attack should have been directed against Yadavs and Nitish Kumars of states. As far as beef-ban is concerned, if you did not raise your voice when pork was banned in Muslim majority J & K, you have forfeited your right to say anything when Hindu majority state ban beef. If Modi has no control over the Yadavs, and Nitish Kumars then, give us control over our state, we demand Article 370 for Maha. Kashmiris were savvy about Indians, unlike us in Maha. We took the Indians for their word, we thought Indians were decent people, who believed in living by the laws of the land, who would not practice racism, segregation and so on. We were deceived, we were shown an apple and sold a lemon. Kashmiris knew better, they demanded and secured Article 370 to protect their interests, their identity, their state from the rest of the country. Thanks to Article 370, no Indian can dare tell the Yasin Maliks, Geelanis, and others what they tell us in Maha. I never said anything about the beef ban, but since YOU brought it up, let me quote Swami Vivekananda: According to Swami Vivekanand, "there was a time in this very India when, without eating beef, no Brahmin could remain a Brahmin; you read in the Vedas how, when a Sannyasin, a king, or a great man came into a house, the best bullock was killed; how in time it was found that as we were an agricultural race, killing the best bulls meant annihilation of the race. Therefore the practice was stopped, and a voice was raised against the killing of cows. Sometimes we find existing then what we now consider the most horrible customs." (Lectures from Colombo to Almora). So there you are. There is nothing unHindu about eating beef, the ban should be vacated, people should be allowed to eat what they consider as their food, the constitutional rights of the people have to prevail not the superstitions and taboos of Hindus, Muslims, Jains, Sikhs and others. Dealing with India's foreign office needs a high-degree of patience, a foreign envoy posted in Delhi said recently. Given New Delhi's track record, many Indians would second him. An agreement with Bangladesh to exchange border conclaves takes 32 years, an MoU to develop the Chahbahar port in Iran takes a decade to seek cabinet approval and so on. But observers believe that things might finally change with impatient prime minister Narendra Modi, shunned by world capitals in the past and now out to put his stamp on the global diplomacy map. Observers cite Modi's recent visit to Mongolia as another case of this government pushing the foreign policy agenda, perhaps obsessively. It was more than four decades ago in 1973 that India committed to partner development programmes in far-off Mongolia. But while past governments were putting aside a paltry Rs 2.5 crore a year, Modi has gone ahead and announced $1 billion aid to the country. Significantly, Mongolia is perhaps the only country which has allowed the external intelligence agency Research and Analysis Wing (RAW) and the National Technical Research Organisation (NTRO) to operate and analyse the cyber data traffic to keep tabs on cyber attacks from China against Indian computer networks. Modi didn't take kindly to former foreign secretary Sujatha Singh attempting to question him, officials said. The tipping point came when the Gujarat government invited Danish prime minister Helle Thorning-Schmidt for the Vibrant Gujarat summit. The visit failed to materialize because MEA refused to budge from its stand that no high-level contact was allowed unless they resolved the issue of Kim Davy, a fugitive in Purulia arms drop case. Sujatha Singh is believed to have cited convention and policy to not deal with Copenhagen until it either hands over or prosecutes Davy. exploiters of tenants is absolutely “unparalleled” in the history of land reform movement in the world. Consequently, lakhs of cultivators of marginal holdings lost whatever they had clung on to for generations to eke out a bare subsistence. in Nehru whose exclusive concern was to stay entrenched in power, had taken over the supposedly idealist freedom fighter. Any means useful towards that end were acceptable. the faujdars had jagirs allotted to them to maintain themselves — and their luxurysteeped life style — and the required number of soldiers and horses. interests, over whom Nehru had no control and who, in turn, ensured passage of such laws that provided legitimate ways in which landed families could retain sizeable holdings.